VEON today marked its official launch in Pakistan as it partnered with Jazz to offer free of charge usage for 53 million Jazz users. For those who don’t know, VEON can be best described as a platform that will offer a bunch of services, from communication to almost every imaginable thing. Basic module will offer communication, i.e. chat, calls, and other functions that one may need for basic telephony. Then there will be additional value additions, such as customers would be allowed to order Careem, Uber or other ride-hailing services from with-in app, then there could be hotel booking feature, an e-commerce store, peer to peer payments and what not. VEON said that possibilities are endless, but they will rely on third-party or partners for services that are mentioned above. VEON, in Pakistan, has already partnered with Jazz Cash, Daraz, and dozens of publishers to begin with. VEON said that it will ideally like partners — that could be small startups to big telcos — to develop solutions that could be offered to millions of VEON customers. Model will essentially expose small startups to wider audience while sharing some revenue with VEON. VEON, with an annual budget of $100 million, will also partner with telcos by luring them through a revenue share — from services that platform will offer — against free data services for VEON users. In actuality, this means that customer will get free data for VEON usage, or for any feature with-in VEON. Telecos, in return will share revenue from the margins that VEON will retain from third-party service providers (Careem for instance). VEON thinks its a win-win scenario for everyone as the entire ecosystem will benefit from the platform. Not to mention, VEON platform — a company of VEON Limited — will operate not as part of Jazz but as an independent entity in Pakistan. 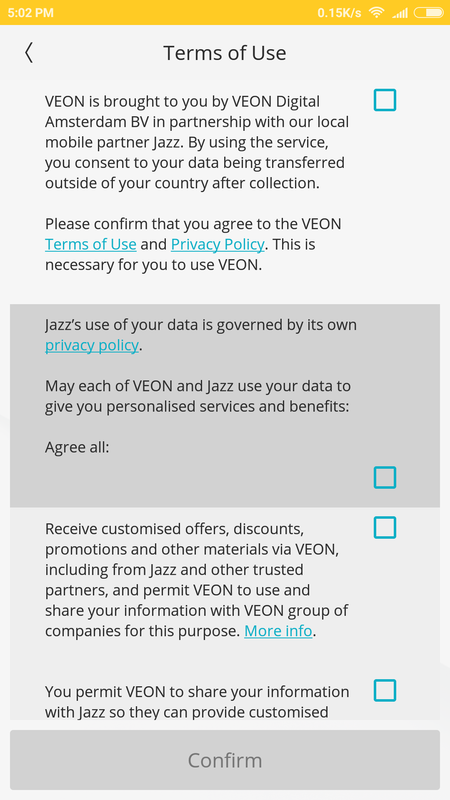 Its agreement with Jazz is non-exclusive and other operators can also partner with VEON, based on their separate terms. You can expect a lot more about VEON, its strategy, offerings and future plans during coming days, but for now you can download the app for Android from here and the iOS version here. Hmm, I downloaded the app… and I don’t really see the appeal. It’s basically Whatapp but with ads? And right now with none of my friends and family on the platform, it’s pretty much useless for me. it will take time dont worry it will spread out in pakistan this major catch is you cant call or use this app over internet when you dont even have balance in ur account. Just tried and doesn’t look like that’s the case. It warns you that calls to non VEON contacts will be charged according to your cellular voice plan. When Viber and Line couldn’t stand by WhatsApp then who’s VEON? Kio Taha? Sure, but who are you? ProPakistani’s local PR guy? same here. Almost everyone is connected to internet 24/7 all thanks to 4g 3g services. Veon Hamaey Small Loan Dega Interest Free ??? So, it is basically whatsapp, right.